This concert is part of Measha’s ongoing artist–in-residency with the MCO, which allows her — and us — to explore unique pairings of repertoire suggested by Measha. The concert begins at 7.30pm on May 23rd at Westminster United Church, 745 Westminster at Maryland. Tickets, at $35 for adults, $33 for seniors and $15 for students and those under-30 (incl. GST), are available at McNally Robinson, Organic Planet (877 Westminster Ave), and on MCO’s Ticketline at 204-783-7377. 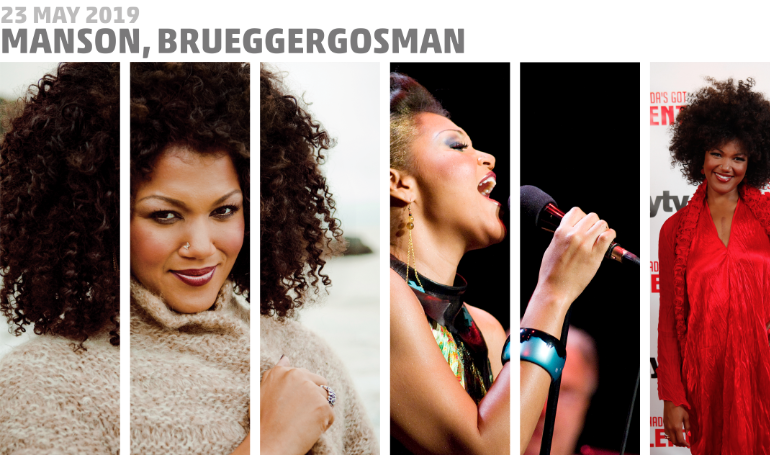 Motivated and hungry for new experiences, Measha Brueggergosman effortlessly embraces the broadest array of performance platforms and musical styles and genres. On the opera stage, her recent highlights include Giulietta and Antonia in Les contes d’Hoffmann, Elettra in Idomeneo, Madame Lidoine in Dialogues des Carmélites, Jenny in Weill’s Mahagonny, Emilia Marty in Věc Makropulos, Hannah in Miroslav Srnka’s Make No Noise, and Sister Rose in Jake Heggie’s Dead Man Walking. On the concert platform she has worked with the San Francisco and New World Symphony Orchestras and conductors such as Daniel Barenboim, Sir Michael Tilson Thomas, Franz Welser-Möst, Sir Andrew Davis, Gustavo Dudamel and Daniel Harding. Measha began her career predominantly committed to the art of the song recital. She has presented innovative programs at Carnegie Hall, Washington’s Kennedy Center, London’s Wigmore Hall, both the Konzerthaus and Musikverein in Vienna, Madrid’s Teatro Real, as well as at the Schwarzenberg, Edinburgh, Verbier, and Bergen Festivals with celebrated collaborative pianists Justus Zeyen, Roger Vignoles, Julius Drake, and Simon Lepper. Her recent and forthcoming highlights include her Australian debut at the Melbourne Symphony Orchestra and recital at the Sydney Opera House, a return to Teatro Real and to London’s Barbican with the BBC Symphony Orchestra, as well as performances with the Philadelphia Orchestra, the Royal Liverpool Philharmonic with Vasily Petrenko and the Los Angeles Philharmonic with Sir Michael Tilson Thomas. Her first recording for Deutsche Grammophon, Surprise, includes works by Schoenberg, Satie, and Bolcom and is one of the most highly regarded debut albums of recent years. Her subsequent disc Night and Dreams, which features songs by Mozart, Brahms, Strauss, Schubert, Debussy, Duparc and Fauré won several awards and her recording of the Wesendonck Lieder with Franz Welser-Möst and the Cleveland Orchestra earned her a GRAMMY nomination. Off stage, Measha is just as active: last year, she released her memoir, There is Always Something on Fire, published by Harper Collins; she appears regularly on primetime TV (most recently advocating on behalf of contemporary Canadian literature); and leads Canadian children across the country in song, to celebrate the nationwide campaign for music education. Measha Brueggergosman champions the education and involvement of new audiences and holds several honorary doctorates and ambassadorial titles with international charities. In Schubert’s tragically brief life of just 31 years, he composed roughly one thousand works. They range from 600 songs to numerous, grandly scaled piano sonatas, symphonies, chamber works and operas. He composed string quartets virtually from one end of his career to the other, from the ages of 14 to 29. Tonight you will hear the second last of them. He composed this dramatic work, which he cast on a broad canvas in the manner of an orchestral symphony or Beethoven’s “Razumovsky” string quartets, in March 1824. It received a private performance in Vienna in 1826, but it wasn’t published until 1831, three years after his death. The nickname of this piece is ‘Death and the Maiden.’ It derived from his using thematic material from his song of the same name (composed seven years before the quartet) as the point of departure for the variations that make up the second movement. He was recovering from serious ill health while composing this work. This may go some way toward explaining his use of the theme from the quartet he associated with death. This does not mean that the idea of death filled him with terror. He may have held to the belief that death is also a friend who grants release from earthly suffering; a belief common to many people in his time and place, and expressed in the poem by Matthias Claudius that Schubert set in the song Death and the Maiden. Launched with a terse, forceful opening statement, the first movement is urgent in character and darkly coloured. The second theme is fresh and lyrical, offering a measure of contrasting lightness. The variations that make up the second movement range from sweet-natured to forceful. At various points, individual instruments take the spotlight and the other players provide accompaniment. The third movement is a brief, tautly constructed and very serious scherzo. Schubert drew its opening melody from a set of German dances for piano that he had composed the year before. The central trio section offers a relaxing interlude. Schubert cast the driving finale in the form of an Italian folk dance, the tarantella. The near-frenzy of this section’s character and energy level give it an almost sinister edge. In a brilliant career that straddled the Renaissance and Baroque eras, Monteverdi composed numerous works, mostly vocal. They proved vastly influential, and their abundant beauty and drama have made them remarkably durable. He was one of the first great figures in opera. Glorious works such as Orfeo (1607) and Il ritorno d’Ulisse in patria (Ulysses Returns to His Homeland, 1639) still hold the boards four centuries after they premiered. His catalogue also includes numerous madrigals, secular works featuring vocal soloists or small vocal ensemble. Lamento della Ninfa (The Nymph’s Lament) comes from the eighth book of madrigals, a collection of pieces that was published in Venice in 1638 under the title Madrigali guerrieri et amorosi (War-like Madrigals and Madrigals of Love). It draws together works that he composed over the preceding two decades. The Nymph’s Lament appears in the second half of the volume. The text by the poet and pioneering opera librettist Ottavio Rinuccini (1562-1621) centres on a maiden whose lover has deserted her. It contrasts descriptions of her melancholy condition with the words of her poignant lament. Purcell is widely considered England’s greatest composer prior to Elgar. His compositions in many fields—especially church music, incidental scores for the theatre, and operas—gave the period of the English Restoration much of its finest musical art. In the early years of his career, he focused on music for the royal court. From 1690 onwards, he shifted his focus to the theatre. He composed numerous operas and semi-operas, plus music to accompany more than forty plays. Venus and Adonis, an opera by John Blow, one of his teachers, was produced during the early 1680s. It made such an immense impact on Purcell that he and librettist Nahum Tate closely modeled their own opera, Dido and Aeneas, upon it. Details of Dido’s conception and premiere remain sketchy. The earliest known performance took place in 1689. The location was a boarding school for young ladies in Chelsea, run by choreographer Josias Priest. The opera may have been created as many as five years earlier, and it may have been intended to be performed by professional musicians at the royal court, rather than the amateur females of Priest’s school. No record exists of further performances during Purcell’s lifetime. A serious rival for the title of ‘Great British Opera’ would not appear until 256 years later, when Benjamin Britten’s Peter Grimes launched a revival of interest in opera in Britain. In 1700, following the free-wheeling theatrical practices of the day, selections from Dido and Aeneas were inserted into a London production of Shakespeare’s play Measure for Measure. Four years later, Purcell’s Dido was revived, once again as a component of a larger production. Then it disappeared for nearly a century. In the late 1700s, it was revived as a concert work, the form in which it has been best known and most effectively performed up to the present day. It is Purcell’s only true opera, in that it is sung from beginning to end without the interpolation of spoken dialogue. Nahum Tate based the text on his own play, Brutus of Alba: Or The Enchanted Lovers (1678), itself derived from Virgil’s epic poem of ancient Greece, The Aeneid. It tells the story of the love between Dido, Queen of Carthage, a city on the north shore of Africa, and Aeneas, a Greek hero. It does so in highly compressed form, to the point where significant episodes in the plot are barely mentioned. This would have posed little difficulty for early audiences, they being well-versed in classical mythology. Purcell responded brilliantly to this challenge, clothing the text in music that is richly expressive yet concise. Dido and Aeneas remains an outstanding example of tragic opera, regardless of period or place of origin. It includes a great deal of dance music, a practice carried forward from an earlier English musical form, the masque. The last scene returns to Dido’s palace and shows the lovers’ final meeting. She mocks his protestations of fidelity, then dismisses him. Suddenly she gives way to despair, and sensing that her life is quickly drawing to a close, she sings this poignant farewell, one of the most beautiful and moving arias in all opera. Toward the end of 1946, four years after he had composed his most recent songs, he came across Im Abendrot, a poem by Joseph von Eichendorff (1788-1857). Its mood suited his world-weary, post-war frame of mind perfectly. The characters, an elderly couple gazing into the sunset, reflected his and Pauline’s situation like a glove. He completed his setting on May 6, 1948. An admirer had recently sent him a volume of poems by Hermann Hesse (1877-1962). From it he chose four pieces, possibly intending to join them together with Im Abendrot to form a song-cycle. He completed only three of them: Frühling (Spring) on July 18, 1948; Beim Schlafengehen (Falling Asleep), on August 4; and September, on September 20. Strauss died without hearing them in concert. He left no indication that he intended them to be performed together, and therefore no sequence of presentation. Ernst Roth, an editor at his publishing company, Boosey and Hawkes, decided that they formed a cycle. The performing order upon which he settled—Beim Schlafengehen, September, Frühling, and Im Abendrot—was followed at the premiere. That took place in London on 22 May 1950, eight months after Strauss’s death. Norwegian soprano Kirsten Flagstad was the soloist and Wilhelm Furtwängler conducted the Philharmonia Orchestra. Soon afterwards Roth, with the benefit of hearing the songs performed, revised the order into the one by which they have been known ever since. These mellow, achingly beautiful works represent—consciously so—Strauss’s musical last will and testament. In them he put aside the realistic horrors of mid-twentieth-century life and returned to the ripely Romantic style of his own early music, deepened by vast intervening experience. Im Abendrot, the fourth song, completes the music’s emotional voyage. After the soprano has sung the final words, “ist dies etwa der Tod?” (can this, perhaps, be death? ), Strauss quoted the “transfiguration” theme from Death and Transfiguration, a tone poem he had composed 60 years previously. As he lay on his deathbed, he said to his daughter-in-law, Alice, “Dying is just as I composed it in Death and Transfiguration.” Pauline Strauss died less than a year later, nine days after the first performance of the Four Last Songs. Known as ‘The High Priestess of Soul,’ Nina Simone (1933-2003, born Eunice Kathleen Waymon) was an American singer, songwriter, pianist, arranger, and activist in the civil rights movement. Her music spanned a broad range of musical styles including classical, jazz, blues, folk, R&B, gospel, and pop. Born in Tryon, North Carolina, the sixth child of a preacher, she initially aspired to be a concert pianist. With the help of a few supporters in her home town, she enrolled in the Juilliard School of Music in New York. She then applied for a scholarship to study at the prestigious Curtis Institute of Music in Philadelphia, where she was denied admission despite a well-received audition. She became fully convinced this rejection had been due to racial discrimination. In 2003, just days before her death, the Curtis Institute of Music bestowed on her an honorary degree. To make a living, she changed her name to Nina Simone. The change related to her need to disguise herself from family members, having chosen to play “the devil’s music” or “cocktail piano” at a nightclub in Atlantic City. She was told in the nightclub that she would have to sing to her own accompaniment, which effectively launched her career as a jazz vocalist. She recorded more than forty albums between 1958 and 1974. She made her debut with the album Little Girl Blue. She had a hit in the United States in 1958 with the Gershwin song I Loves You, Porgy, won two GRAMMY awards, and was inducted into the GRAMMY Hall of Fame in 2000. The song Since My Love Has Gone was based on the aria Addio del passato from Giuseppe Verdi’s opera La traviata (1853). Black is the Colour of My True Love’s Hair is an old, traditional Scottish folk song that first became known in North America in the Appalachian Mountains. Nina Simone performed it frequently, and her several recordings are exceptionally expressive and soulful.